Charge your NOOK for about 5 hours from a wall outlet using the Power Adapter and USB Cable. The indicator light at the bottom of your NOOK will turn green when the NOOK is fully charged. 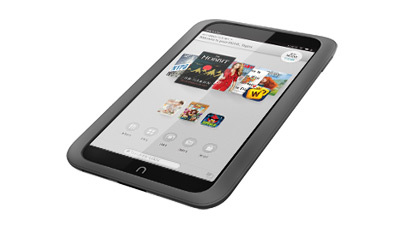 Turn on your NOOK by pressing inwards on the power button, located at the top of the back panel of your device. Review the Terms of Service and tap Agree. If you have an existing NOOK account, follow the on-screen instructions to sign in. Please be sure you have a default credit card and billing information saved in your account.